Elegant, solid, and speedy, this new Tartan is a high-end package which places a premium on beauty. 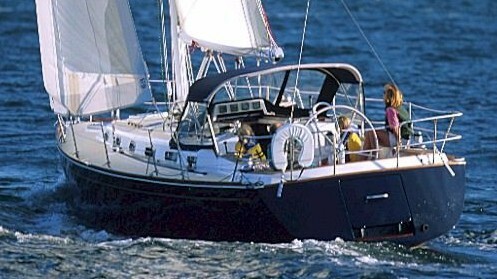 I stepped aboard the Tartan 4000 twice, once on each coast, and both times I was struck by its fashion and function. By the time I visited hull number seven of the design, which was also the first one on the West Coast, I knew I was aboard a representation of what the new ownership of Tartan and C&C were targeting and touting: “A yacht that delivers both luxurious accommodations and safe, well-mannered sailing performance in all conditions.” Would this statement live up to the company’s history, which includes the pioneering of classic early fiberglass cruising sailboats like the Tartan 34? Let’s find out. Built to be as pleasing to the eyes as it is to sail, the Tartan 4000 looks to be an instant classic. Boarding the new Tartan 4000 is easy from the stern where a drop down in the transom creates a nice swim platform. Twin helms on carbon fiber pods flank the end of the centerline drop-leaf table that also serves as the binnacle for instruments. Twin wheels are a new feature, and they open up this ergonomic cockpit very nicely while providing good sight lines forward from either side. 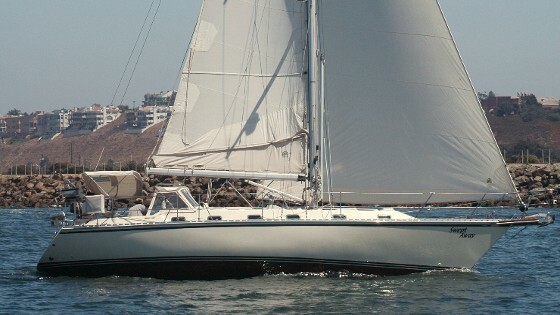 Tartan again highlights its Cruise Control Rig (CCR) which includes a carbon fiber mast (to save weight aloft) with aft-swept double spreaders, a split backstay, a self-tacking 100% jib on a solent stay and a 155% genoa on a furler. The Park Avenue, or pocket, boom looks like a mini version of the scoop booms on giant race boats and makes handy work of capturing the mainsail as it falls between lazyjacks that are controlled with a single line. 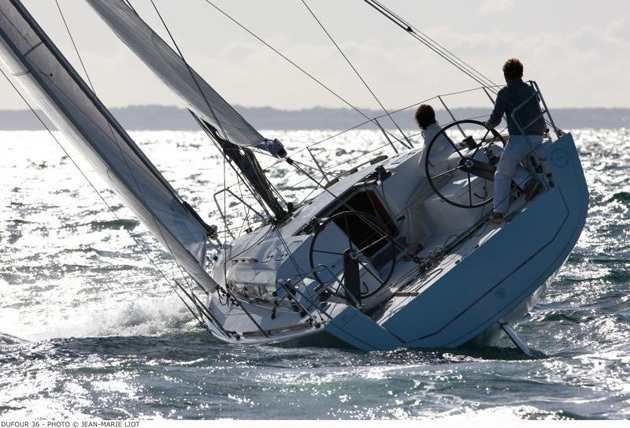 It’s a lightweight rig that’s easy to sail singlehanded and instills confidence in its crew. 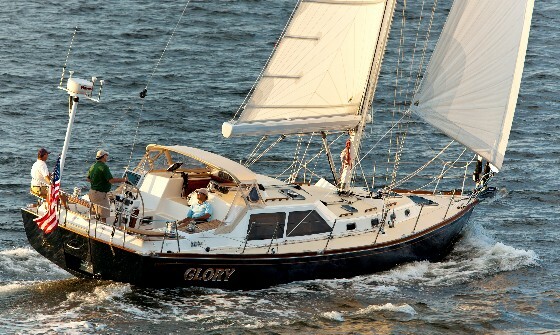 The Tartan 4000 comes standard with a beavertail bulb keel that draws six feet. 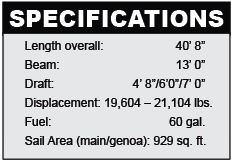 Two other configurations are available including a (seven foot) deep fin and a centerboard (four foot, eight inches). The Ohio-built design carries its beam well aft which adds volume below and keeps her on her feet in a fresh breeze. The foam cored epoxy and glass sandwich construction is solid below the waterline and has reinforced high load areas and attachment points. 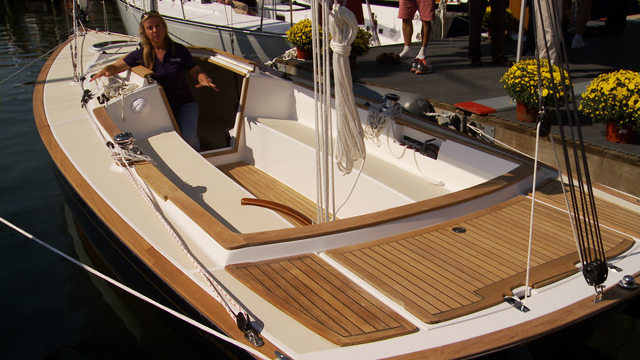 The hull is topped by an end grain balsa cored deck that has a molded nonskid surface. The decks are wide, the sheeting angles are tight, and the boat feels solid even under all her canvas, which is well over 900 square feet. She’ll do six to eight knots in flat water on a reach, will motor at seven knots at 2000 rpm, or just over eight knots at wide-open throttle around 3000 rpm. A three-blade folding prop is optional. 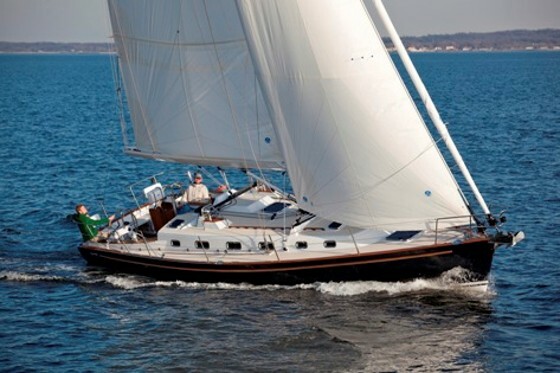 Mostly, she’s easy to sail and is so well-behaved that there is zero fear factor in most conditions—which will get people out sailing more often. I’m not wild about the teak rub and cap rails. They’re pretty but not terribly practical, and I’d rather see an aluminum toe rail with multiple attachment points and lower maintenance. The stainless-steel chocks on the bow are nice to have but are a bit tight and hard to feed a line through, especially in a hurry or under load. But these nods to tradition are what makes a Tartan so noticeable at the yacht club dock, where looks are likely to start conversations sooner than practicality. What the heck—sometimes it’s nice to just admire something beautiful. Fittings like these are sure to strike up conversations at the yacht club dock. 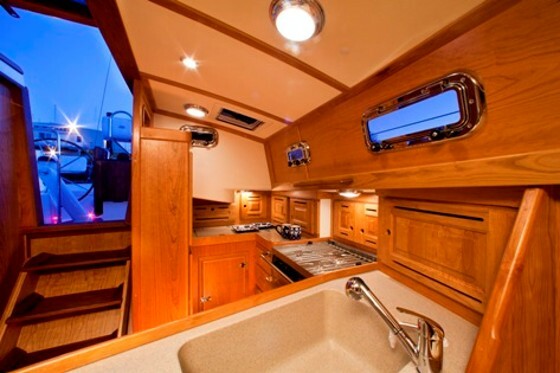 The Tartan 4000 has a two-cabin, one-head layout, with ample stowage and a rich, warm feeling throughout. Forward is the master stateroom with an island queen berth, a cedar-lined hanging locker, a small seat, and private access to the head. The optional air conditioning system and the holding tank are housed under the berth. The single head is nicely finished with wood trim and has a separate stall that’s large enough for an adult to take a shower without banging body parts against bulkheads. The saloon has an L-shaped settee to port and a straight settee to starboard with a drop-leaf table in between. A sizeable forward-facing nav station is a nice traditional feature to starboard, just ahead of the entry to the guest cabin aft. The galley is C-shaped and to port. Stowage is extensive with dovetailed cutlery drawers and Luxe granite counters made of a foam sandwich, to save weight. A three-burner Force 10 stove/oven combination, dual sinks, and a microwave make it feel like a home kitchen. Inside, the Tartan maintains its classic - and classy - looks. Access to the 55 hp Volvo diesel is behind the companionway steps, which lift up on gas-assist shocks. The engine with SailDrive powers this boats' 19,000 pound-plus displacement with ease. Behind the engine there’s room for an optional 3.5 kW Mastervolt genset, and reasonable access makes it serviceable. The 4000 has a handcrafted solid cherry sole and cabinetry with excellent wood joinery and a smooth satin finish. It’s immediately clear you’re not aboard a run-of-the mill production boat, when surrounded by acres of gleaming wood and furniture-grade fixtures. The Tartan 4000 is a beautiful boat,and beautiful doesn’t come cheap. The base price is $445,000 and that ticks up to $520,000 with the options that most people will want. 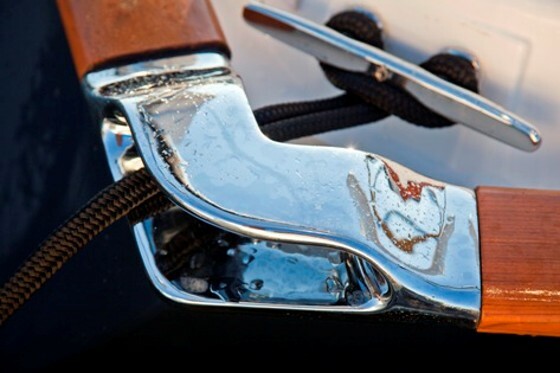 That’s not insignificant, but those who desire an elegant and solid-feeling boat built in the U.S. will find few worthy competitors—at any price point. 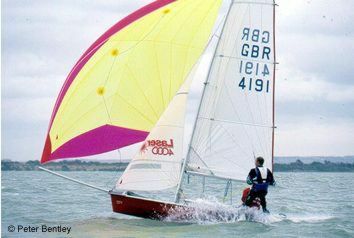 Laser 4000: The Definitive Modern Single-Trapeze Boat?